Have you ever dreamed of indulging in private cooking lessons with someone who could instill a confidence in your cooking skills you never thought possible? Join award-winning cooking teacher and author Joanne Weir for an unforgettable, wryly original series of cooking lessons with real-world students working side-by-side with her in the kitchen. Shot in Weir's home kitchen in San Francisco, Joanne Weir's Cooking Class invites viewers to share friendly, funny interludes with a perceptive teacher and determined students in a 26-part series of cooking fundamentals. Weir has already taught thousands of people in hundreds of cooking classes around the world her techniques, trade secrets, and seasonally based recipes. Her new student body is an eclectic mix: Ron a firefighter, Emily a media consultant, Jeff a general contractor, Nicolas an opera singer, Barbra a professional kitchen designer, Kyle an accountant, Helen a business entrepreneur. Weir even brings in her brother John, an architect. As they cook alongside Joanne, the students reveal family traditions from many different backgrounds and anecdotes from their own cooking disasters or successes. Each episode features Joanne showing a student and viewers what can go wrong and how it doesn't have to go wrong, even with a nervous neophyte cook manning the whisk or the chopper. As with any learning process, mishaps do occur. She guides each student through solutions to their (and many home cooks') real-life dilemmas—be it a broken crème anglaise, gummy risotto, sunken soufflés, or over-whipped, weary egg whites. At the end of each lesson, Joanne and her student taste the fruits of their labors and discuss lessons learned and new ideas. Within each episode are Joanne's reflections and remarks and students' testimonials that give the series a slightly irreverent, reality show feel. There are also frequent discussions of old myths and new possibilities in food and wine pairing segments with wine expert Eugenio Jardim. The students bring diversity of cooking skills as well as diversity of backgrounds. Some are learning to chop vegetables properly for the first time, while others are adding refinements to their skills. Joanne loves to share what she has learned over the years, showing each student a new technique or favorite trick Whether she is showing Ron how much liquid to add for the creamiest Spring Vegetable Risotto, teaching Linda how to segment oranges for Braised Fennel with Oranges, instructing Jeff on the correct method of hand-beating egg whites for the lightest Spicy Corn Soufflé, showing Kyle how to brown not burn butter for Pappardelle with Herbs and Brown Butter, or demonstrating for Emily the classic technique for deglazing a pan, Joanne works side-by-side with them, coaching and correcting along the way. 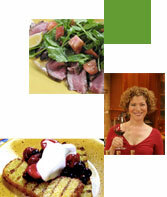 Joanne Weir is a television favorite, thanks to her role as host of the highly successful American Public Television series, Weir Cooking in the City, and two seasons of Weir Cooking in the Wine Country. With a year-round teaching schedule that takes her all over the globe, a cooking background that spans four family generations, and five years of professional "chefdom" at the legendary Chez Panisse restaurant in Berkeley, California, Weir's passion for food and love of teaching keep her classes booked season after season. Many culinary experts have superb knowledge, but the ability to share it easily and zestfully, in person and on air, is something special. Joanne Weir's Cooking Class reflects the current phenomenon that has swept America—an interest in cooking, in decoding culinary enigmas, by everyone from novice cooks to practiced kitchen hands. The trend is stoked by cookbooks, television shows, magazines, online recipe sites and the blogosphere. Now, with every episode in Joanne's new series, home cooks of all skill levels increase their own proficiency while enjoying the students' travails and ultimate triumphs in the kitchen.